Larry Christopher Allen Jr. (born November 27, 1971) is a former American football guard who played in the National Football League (NFL) for fourteen seasons. He was drafted by the Dallas Cowboys in the second round of the 1994 NFL Draft. He played college football at Sonoma State University. At 6 ft 3 in height and weighing 325 pounds, Allen is regarded as one of the physically strongest men to have ever played in the NFL, having recorded an official bench press of 705 lb (320 kg) and a squat of 905 lb (411 kg). Allen grew up in Compton, California, and had a troubling childhood, including contracting meningitis and almost dying at 6 weeks old, as well as being stabbed 12 times in the head, shoulder and neck by a young neighbor while trying to protect his brother at the age of 10. He attended a different school in each of his four years of high school. As a freshman at Centennial High School in Compton, he lettered in football. For his sophomore year, he attended Tokay High School in Lodi. As a junior, he transferred to Edison High School in Stockton. He finished from Vintage High School in Napa, California, but did not graduate. Allen didn't have the grades to play Division I football, so he attended Butte College in Oroville, California. In his two years there, the team went 10–1 while winning the Golden Valley Conference, and Allen was named to the All-Conference and All-State teams both seasons. He was also recognized as a J.C. All-American after his sophomore year. Allen did not attend any school the following year. After a year away from school, he enrolled at Sonoma State University, a Division II school north of San Francisco. In two years at Sonoma State, Allen gave up just one sack and was a two time All-American. The Cossacks were primarily a passing team and established 10 new school records, including most yards gained, most touchdown passes, best gain-per-completion and highest passing efficiency. During his senior season, the team set a school mark with 334 rushing yards against Cal State Hayward. As a senior he participated in the East–West Shrine Game and the Senior Bowl. In 1994, Allen started 10 regular season games rotating between guard and tackle. During the season he tied Burton Lawless in 1975 and Kevin Gogan in 1987, for the most starts on the offensive line as rookie in club history at the time, Flozell Adams broke the record in 1998. Allen helped Dallas establish a then team record by allowing just 20 sacks totaling just 93 yards (fewest in the NFL) while earning all-rookie honors. Allen was forced into starting just four games into his rookie season when Mark Tuinei suffered back spasms on the road against the Washington Redskins. He received the game ball for helping keep the Redskins sackless for the game. He recorded his first NFL start at left tackle, replacing an injured Tuinei against the Arizona Cardinals. This marked the first time a rookie offensive lineman had started for Dallas since November 24, 1991 when Erik Williams started at right tackle against the Redskins. Allen returned to a back-up role for the next two weeks, but early in the morning on October 24, Williams was injured in automobile accident and was out for the rest of the season. After which, Allen was moved into the starting line-up at Williams's right tackle position permanently beginning at the Cincinnati Bengals on October 30. He received game ball, along with Tuinei, for helping hold the New Orleans Saints without a sack in a Monday night win in New Orleans on December 19. In that Monday night contest, the 325-lb. Allen shocked the Saints by running down linebacker Darion Conner from behind on an interception return early in the game. The announcers were talking more about Allen's amazing feat, than the actual interception. In his first playoffs, Allen received the game ball against the Green Bay Packers on January 8, when the Dallas offense recorded 450 total yards and Troy Aikman completed 23-of-30 passes for 337 yards. Allen sprained his left ankle during the game, however he returned to play. In the NFC Championship Game at San Francisco 49ers, he struggled playing through three quarters on his injured ankle before leaving the game. Allen earned recognition as part of an offensive line that allowed the second-fewest sacks (24) in the league, behind Indianapolis who allowed just 14, and one-or-fewer sacks in nine-of-16 games. He helped lead the way as the Cowboys gained 541 total yards while giving up only one sack in 50 pass plays in first career start at left guard at Washington on September 12. He helped lead the way as Emmitt Smith became just third player in last 29 games to rush for over 100 yards against the Atlanta Falcons on September 20, when he rushed for 109 yards. Allen's blocking helped the Cowboys offensive line allow only one sack in 40 pass plays in Philadelphia on October 10. He gave up no sacks on 32 pass plays, to the Redskins on October 24. His blocking helped Smith to rush for 140 yards and two touchdowns in the first half as the Dallas offense recorded 205 rushing yards in Minnesota on November 8. Allen helped the Cowboys running backs record 149 yards before leaving game in third quarter with sprained medial collateral ligament (MCL) in his right knee against the Packers on November 14. He missed the his first career game in Arizona on November 21, snapping strings of 97 consecutive games played and 90 consecutive starts. He missed the next four games with a sprained knee. He returned to the starting lineup in New Orleans on Christmas Eve and helped the Cowboys offensive line give up no sacks on 39 pass plays while helping Smith to rush for his eighth 100-yard game of the season. In the season finale against the Giants on New Year's Day, he helped block for Smith as he recorded his ninth 100-yard game of the season. Allen was also part of an offensive line that did not allow a sack in 33 pass plays during the game. In the NFC Wild Card Playoff Game in Minnesota on January 9, he opened holes for Smith to rush for 99 yards, including a Dallas postseason record 65-yarder. He began the season by straining his hamstring during practice four days before the season opener. However he still started against the Falcons, but aggravated his hamstring in the second quarter and sat out remainder of half before coming back for the second half as offense recorded 403 total yards. He played at the New York Giants on September 15, and helped protect Quincy Carter, allowing him to throw for 321 yards in leading Dallas to a come-from-behind overtime win. He suffered a sprained left knee in the second quarter against the Cardinals on October 5, but returned in the second half to help Dallas total 365 yards of offense. Despite playing sporadically against the Washington on November 2, due to a sprained left knee suffered in the first quarter, he helped the Cowboys record 400 yards of total offense, including 208 rushing yards. Allen also helped hold DT Kris Jenkins to zero sacks, while the Dallas line allowed only one sack for zero yards in 45 pass plays against the Panthers on November 23. He also helped lead way for Troy Hambrick to run for 189 yards against the Redskins on December 14. On March 21, 2006, Allen was released by the Dallas Cowboys, after spending his first 12 seasons with the organization 1994–2005. 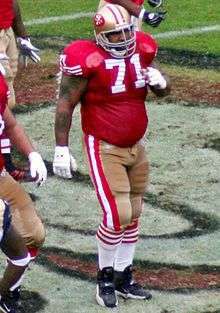 In 2006, three days after being released by the Dallas Cowboys, Allen was signed by the San Francisco 49ers as an unrestricted free agent. Along with changing teams, he also changed number, from the only number he had worn in his professional career, 73, to number 71. For the season, he played and started in 11 games and was inactive for five with sprained medial collateral ligament (MCL). He was voted to his 11th career Pro Bowl after blocking for RB Frank Gore's franchise record 1,695 rushing yards on the season. He resides in Danville, California. ↑ Aron, Jaime (July 29, 2001). "700-pound bench press makes Cowboys OL Allen noteworthy powerlifter, too". Abilene Reporter-News. ↑ Padecky, Bob. "Larry Allen's long road from SSU to the NFL Hall of Fame." www.sonoma.edu, February 2, 2013. Retrieved April 27, 2016. 1 2 Corbett, Jim (February 2, 2013). "Parcells, Carter finally make Pro Football Hall of Fame". USA Today. Retrieved 2 February 2013. ↑ Sabin, Rainer (February 2, 2013). "HOF decision nears: Larry Allen close to capping Compton to Canton journey". Dallas Morning News. ↑ "State Football Recruiting Roundup: Signing isn't close to guarantee for ultimate success in the sport". CalHiSports.com. February 6, 2013. ↑ Hill Jr., Clarence (2008-08-29). "Cowboys sign Larry Allen to let him retire with club". Fort Worth Star Telegram. Star-Telegram.com. Retrieved 2008-09-08.